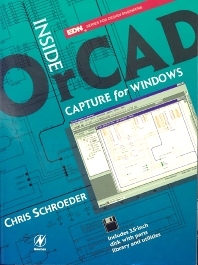 Inside OrCAD Capture for Windows is a reference manual and tutorial for engineers and technicians who use OrCAD as an engineering design assistance (EDA) tool. This introduction to OrCAD is designed to give easy access to practical information. Important subjects, such as export of schematic data for use in circuit analysis or PCB design, are expanded well beyond the information available in OrCAD's documentation. The command reference is a complete listing and explanation of the OrCAD commands and functions. A series of appendices provide important tips and techniques and information about linking OrCAD to other CAD/CAE tools used in the electronics design process. A utilities disk is included. Exercises at the end of each chapter make this book appropriate for academic use. The accompanying disk contains a parts library for the tutorial exercises and several useful utilities such as a bill of material sort, making this book a valuable tool for the design engineer or engineering student. Chris Schroeder is the Technical Director, Electronics, for Crane Technologies Group, Inc., Daytona Beach, Florida, a leading automotive aftermarket and original equipment supplier. He has 19 years of engineering, marketing, and management experience in the electronics industry and has a broad, yet in-depth technical knowledge of both design and manufacturing. His specialized areas of design expertise include: embedded controls using RISC microcontroller technology, assembly language programming, magnetic design for switching power supplies and ignition coils, and printed circuit board design, including the use of surface mount technology.